Climate change often conjures up images of heat, drought, and hurricanes. But according to the latest US National Climate Assessment, released on November 23, 2018, winters have warmed three times faster than summers in the Northeast in recent years. These changes are also producing significant effects. Historically, over 50 percent of the northern hemisphere has had snow cover in winter. Now warmer temperatures are reducing the depth and duration of winter snow cover. Many people assume that winter is a dormant time for organisms in cold climates, but decades of research now show that winter climate conditions—particularly snowpack—are important regulators of the health of forest ecosystems and organisms that live in them. We study northern hardwood forests, which are dominated by sugar maple, yellow birch, and American beech trees and span 85,000 square miles, from Minnesota and south-central Canada east to the Canadian Maritime Provinces and the northeastern United States. These forests are famed for their vibrant fall colors. They generate revenue by drawing tourists, hikers, hunters, and campers, and support timber and maple syrup industries. They also provide important ecological services, such as storing carbon and maintaining water and air quality. When winter encroaches on this region, with temperatures often dipping well below freezing, every species needs insulation to cope. Tree roots and soil organisms such as insects rely on deep snowpack for protection from the cold–a literal blanket of snow. Even in subzero temperatures, if snow is sufficiently deep, soils can remain unfrozen. 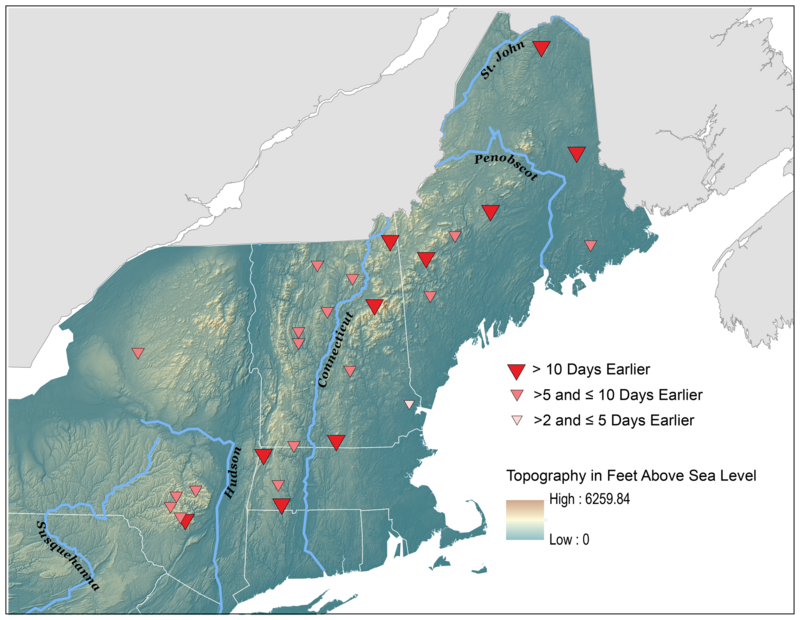 Six decades of research from the Hubbard Brook Experimental Forest in New Hampshire–one of the longest-running studies of its kind–show that winter snowpack is declining. Research conducted by other scholars indicates that if this trend continues, it will increase the likelihood of soil freeze-thaw cycles, with harmful effects on forest health. In our most recent paper, our climate and hydrological models show that the area of forests across the northeastern United States that receives insulating midwinter snowpack could decline by 95 percent by the year 2100. Today, 33,000 square miles of forests across northern New York and New England typically have snowpack for several months in winter. By the year 2100, this area could shrink to a patch smaller than 2,000 square miles–about one-fifth the size of Vermont. Sugar maples can account for more than half of annual forest biomass accumulation at Hubbard Brook. Consequently, changes in climate that reduce winter snowpack and increase soil freezing could reduce forest growth rates in the northern hardwood forest region by 20 percent just through their impacts on these trees. But we know that yellow birch also suffers root damage in response to soil freezing, so our estimate for changes in whole forest growth is likely to be low. Our work shows how often-overlooked changes in winter climate can impact forest ecosystems. Losing snowpack can reduce forest growth, carbon sequestration, and nutrient retention, which will have important implications for climate change and air and water quality all year-round. This work was supported by the Agricultural Research Service, National Science Foundation, U.S. Environmental Protection Agency and Andrew W. Mellon Foundation. Pamela Templer is a professor of biology at Boston University and Andrew Reinmann is an assistant professor of environmental sciences at CUNY Graduate Center and a postdoctoral research associate at Boston University. A version of this article was originally published in The Conversation. in our real context to minimize the effects of climate change giving awareness to all community and giving teaching martial (different local language) related with deforestation for all community and also give them other energy source to food preparation.